Wild Duck Racing would like thank C&M Auto Service of Glenview, who again has helped us get back on the track. While getting the kart ready for racing last week at Badger, I found the rear bumper mount had cracked and broken completely off. This was mostly likely a result of the roll the kart took a few months ago. The folks at C&M Auto welded it back together for us. It is a chrome part and it looks great and is solid. We have C&M take care of all our daily drivers with regular service, including the pickup we travel to races with. Thanks again Chuck! This week we headed to Briggs & Stratton Raceway Park to race with the Badger Karting Club. We arrived just about 9 o’clock which left us plenty of time to get ourselves sorted and registered. 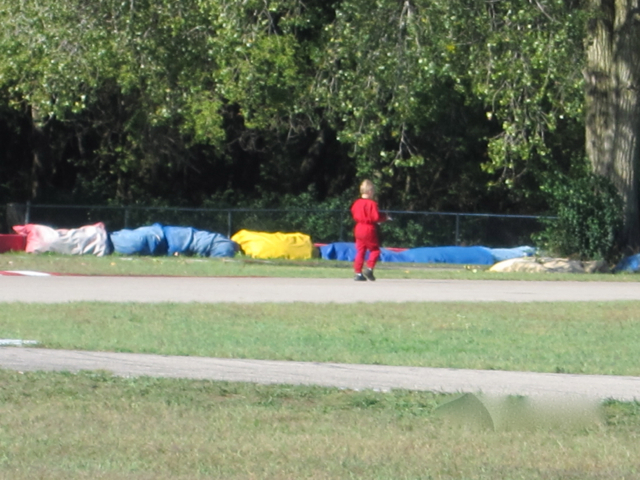 While I unpacked the kart and helmet for the mandatory pre-race safety inspection, Jason took the the map of the track line and walked the track while he studied the map. This exercise should help him figure out how to get around the track faster. There are lines on the map and tire marks on the track. Since we don’t get to Badger very often, having him slowly thinking about the turns should help give him those few seconds we are looking for. He studied this map all day long. He even took it to help his fellow kid karts find the racing line. Now, it just needs to click. For the first practice session he started in the 5th position. The goal was to remember the track and keep an eye on the motor bike that starts the race. I asked him to watch the other racers and try remember the track. His start was ok, he dropped to 7th or 8th an pretty much stayed there for the duration. This was fine, he was just happy to be back on the track. During inspection, I discovered that we needed to adjust the rear wheel spacing because they were out of spec. This was a rule I was not aware of and they have recently having issues with it at Badger. They cannot be more than one inch to the inside of the body work. We put skinny wheels on instead of the fat wheels a few weeks ago, and now the wheels were 2-3 inches inside of the body work. During the break between the practice sessions, I figured out how to take the hubs off and move them out. This should also help the kart handle a little better on this twisty track. For the second practice Jason started in the 5th position. His start(Video) was very good and jumped to 4th place at the first corner. By the second corner, #51 was able to catch Jason and passed him at the entrance to the hairpin. Jason chased #51 for a couple of laps but then and passed him back at the entrance to “no-mans land”, the straight down to the kink and then the front straight. Jason’s kart has a little more speed on the straights and Badger has three nice long ones that he can really fly down. He held the 4th spot all the way to the finish. Badger runs two practice sessions and two heats without a “feature” race. For the first heat he started in the 7th position. Just as the Kid Kart novice race was finishing he noticed that he had forgotten his chest protector – a critical piece of safety equipment for these little kids. I sprinted back to the truck to retrieve it and raced back to the fence. Luckily, one of the other dads had noticed our situation and was ready to help. I tossed it over the fence and he put it on Jason as I ran back to the start, making it just in time. His start was really good; he picked up two places at the start and made it stick for the rest of the run. He finished the heat in 5th place. For the final heat of the day Jason started(Video) in the 3rd position, he gave it up pretty quickly at the first corner at the start. He stayed there while the 5th position #22 tried and tried to get by Jason. Eventually, Jason began to pull away and begin to reel in #117 who had dropped from position two to third place. Jason finished the heat in 4th place. Turns out that #117 dropped his air filter and his engine was not performing well. Needless to say it was a great race and he was showing improvement. I really like it when Jason races at Badger. Everyone we have met there has been very friendly and helpful. 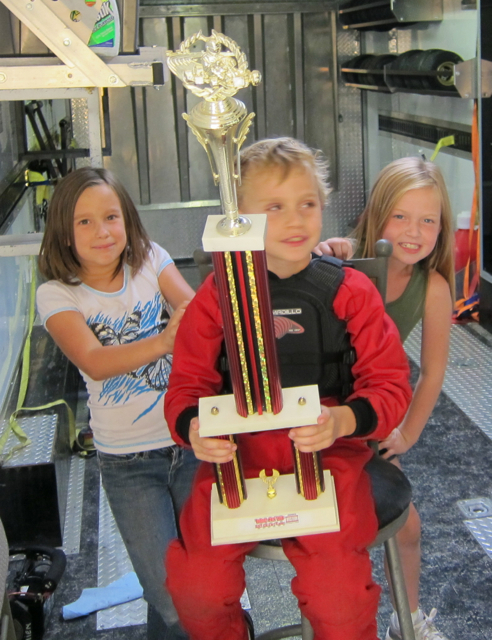 We both like to race there because the competition is really good, with lots of fast karts and good kids to play with. Jason really likes it because he gets a trophy after the last race. As you can see in the picture above he grabbed a really obnoxiously big trophy. The video below is the his “Trophy Run” from the second heat and you can watch the full race on youtube. Jason is still working on finding his groove at Badger. He really just needs more practice to get some really fast times. It is a pretty difficult track with long straights and lots of quick turns. There are few corners where he is off the gas and is coasting, but with the right line he could just sit on the gas and really go. For a bit of detail of how fast these kids go: the track is 6/10 of a mile long. Each race is 7 laps, so about 3.5 miles. His average time around the track is 55 seconds which works out to about 36 mph. All in all, it was really a great day of racing. I wish we were able to come here more often. We will be practicing at Concept Haulers on Saturday 9/16 in preperation for the 9/29 race there. Our next race is at Road America on Sunday 9/16, so come watch us. This weekend thanks goes to C&M Auto Service, Brian Julian and Family (Happy 6th Birthday Dylan and thanks for the cake) and of course my lovely wife Karen and my daughter Katie for supporting us.